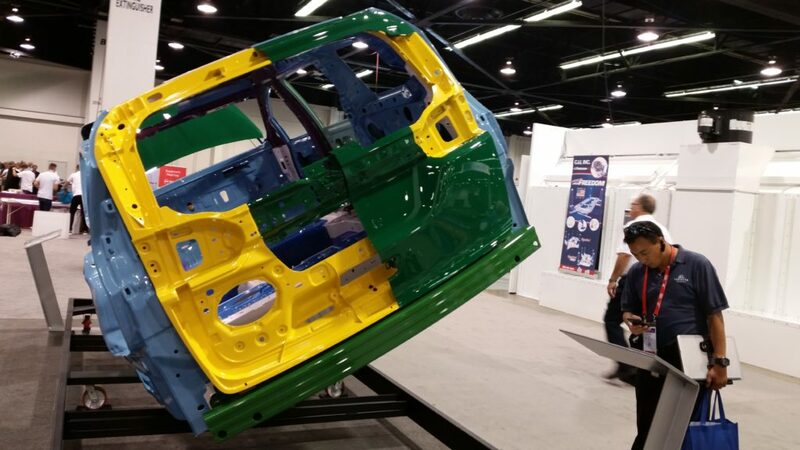 Magnesium might not be as popular for lightweighting as steel alternatives like composites or aluminum (or more advanced steel), but it’s crucial that technicians understand what to do — and not do — when they encounter it. A good example of potential considerations can be found in the free 2017 Chrysler Pacifica body repair manual on FCA’s Mopar Repair Connection website. 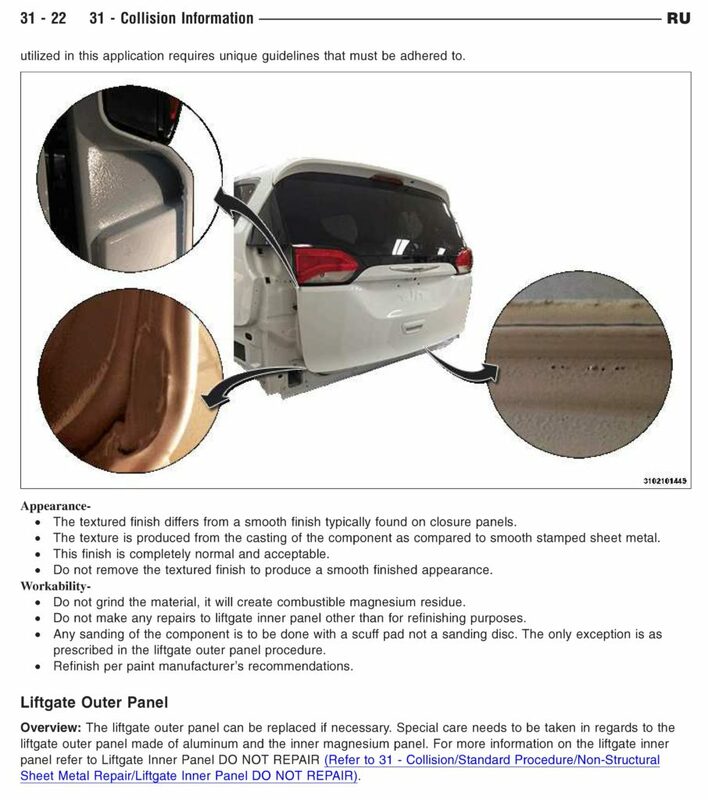 FCA has warned collision repairers to never grind the magnesium Pacifica liftgate inner (seen in yellow in the color-coded body-in-white photographs above and below) or any other part containing the metal, given the “highly combustible” nature of the ensuing residue. Protect yourself and your colleagues. Listen to FCA and don’t grind or repair the part. The inner liftgate is replace-only; FCA even titles one discussion of it with “DO NOT REPAIR” in bold and capital letters. 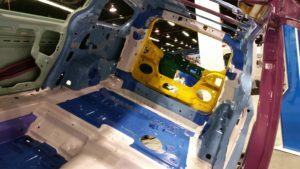 And make sure overly zealous work on the aluminum outer doesn’t lead a technician to mistakenly start grinding the magnesium inner, FCA warns. • The textured finish differs from a smooth finish typically found on closure panels. • The texture is produced from the casting of the component as compared to smooth stamped sheet metal. • This finish is completely normal and acceptable. • Do not remove the textured finish to produce a smooth finished appearance. Should a technician start a magnesium fire by violating these rules, shops should use a D-class extinguisher — one intended to put out burning metals — to knock it down, FCA advises. Throwing water on the fire can react with the magnesium to create magnesium oxide and hydrogen gas and make the blaze far worse. Also, don’t look directly at burning magnesium, or you’ll risk eye damage. The liftgate also should not be exposed to temperature above 500 degrees (260 Celsius), and certainly not to open flame (which is much hotter), FCA warns. Fun fact: Unlike higher-strength steels, which grow weaker when exposed to heat, magnesium is quite resilient in this regard, according to FCA. So the temperature warning appears to be intended more at protecting shops from fires than the structural integrity of the magnesium. Magnesium’s ignition temperature is higher than 500 degrees, but as the powder is a major combustion hazard — it can even spontaneously combust — FCA probably doesn’t want to take any chances, and neither should a shop. Larger bulks of magnesium can prevent ignition, according to a CanmetMATERIALS researcher in an Advanced Materials & Process article, which at least in part probably explains why FCA calls the residue a combustion threat but says a liftgate damaged in a collision isn’t.